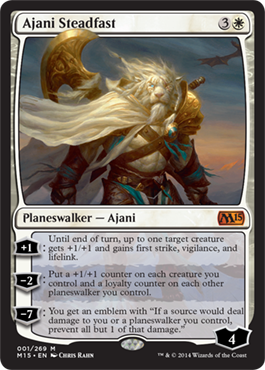 Eric's Review - Ajani Steadfast is the fifth version of Ajani and is pretty powerful. He costs four mana and has four loyalty. The +1 ability is really powerful, the -2 ability is also really powerful, especially when this is the first planeswalker to be able to put loyalty counters on other planeswalkers, and the -7 is not as strong as I would like. You get an emblem, but it reduces each source's damage dealt to you or a planeswalker to one. If you are attacked by five creatures, you're still taking five damage which isn't too bad compared to the amount of damage you would normally take, but it still isn't the best ultimate ability I've ever seen. 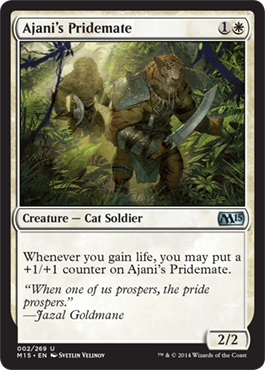 Bottom Line: This will be good in Standard, but only in a "Superfriends" deck. It could also work well in EDH, and planeswalkers are always good in limited. 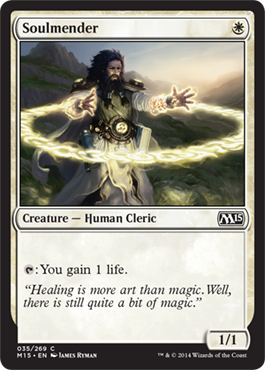 Eric's Review - The return of a classic, you get a 2/2 for two mana and when you gain life, you get +1/+1 counters on it. Definitely can be powerful in the right deck. Bottom Line: Limited, but also viable in Standard lifegain decks. 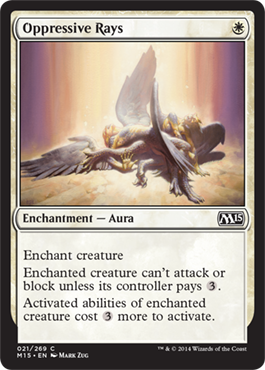 Eric's Review - The second coming of Avacyn is a 5/4 flyer for five mana. She also has vigilance and abilities to prevent damage from sources dealt to creatures and dealt to you. 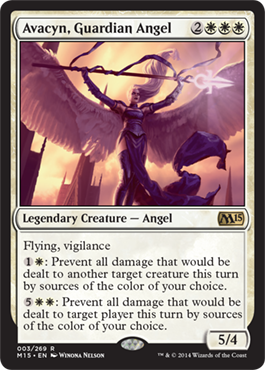 Bottom Line: This Avacyn would be an interesting commander in EDH. 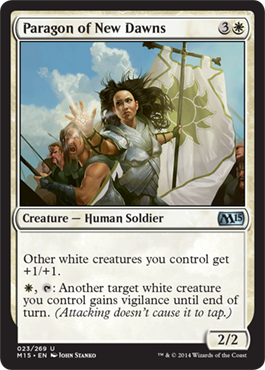 I don't see a strong purpose for her in Standard, Modern, and she may be decent in Limited, but not too great given the triple white mana. Eric's Review - Three mana for double strike on a creature. Not bad, but not the best either. 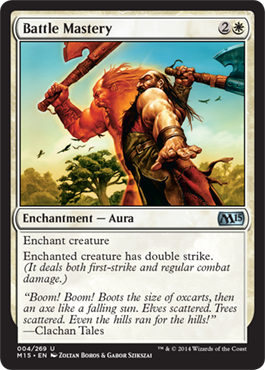 Bottom Line: This is definitely good in limited and this could be good in a Standard enchantments deck. This will also find a place in my Zur the Enchanter EDH deck. 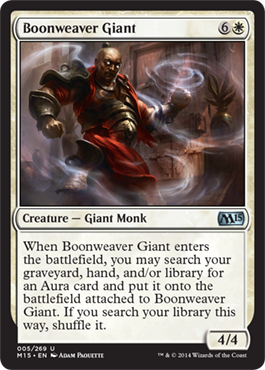 Eric's Review - A 4/4 for seven mana that lets you search for any aura and attach it to Boonweaver Giant. Considering the auras you can search, this could be pretty powerful, yet very costly. Bottom Line: This is more of a limited card as seven mana is a bit too much in most decks. 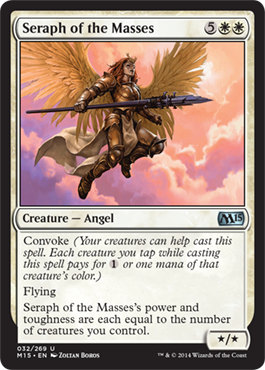 Eric's Review - Congregate is a great card in lifegain decks as you can gain life for all creatures on the battlefield. Bottom Line: Can be in Standard, definitely good in limited. 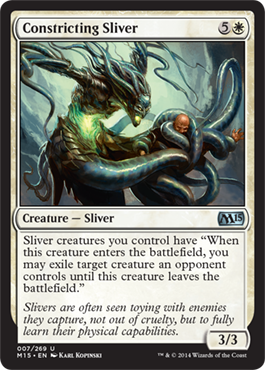 Eric's Review - A sliver that lets other slivers exile other creatures. It may cost six mana, but it's powerful. Bottom Line: Definitely a well needed sliver. M15 limited doesn't seem like a format to effectively use slivers, but it could work in any sliver deck. 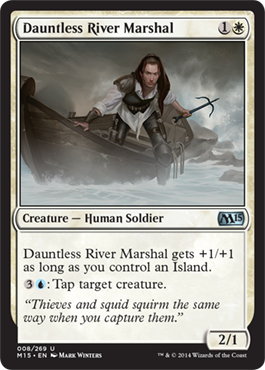 Eric's Review - Dauntless River Marshal is effectively a 3/2 and you have the power to tap other creatures. 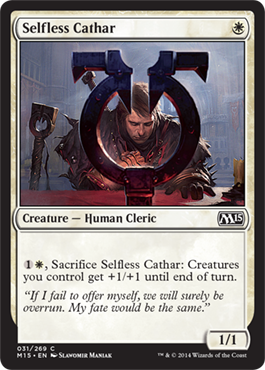 Bottom Line: Useful in limited and seems like a good card for Standard and possibly EDH. Eric's Review - A powerful spell to destroy a creature especially with Convoke. 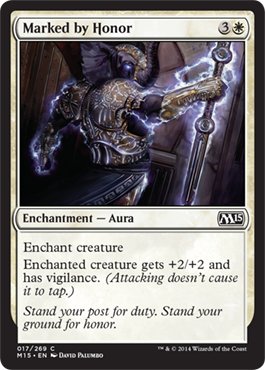 Bottom Line: This will definitely be a powerful spell in Standard, EDH, Limited, and possibly Modern. Eric's Review - A reprint found in many core sets. Definitely a classic. Bottom Line: Good anywhere you can play it. Eric's Review - A two mana spell that gives a creature indestructibility. Bottom Line: Definitely a powerful spell for protecting creatures in any format. Eric's Review - A four mana enchantment that gives you a 1/1 soldier token at the start of each turn if you lost life the previous turn. Bottom Line: Good in limited, and pretty strong for Standard too with the creatures like Herald of Torment. Eric's Review - A 3/1 with flying for three mana is decent. not too great. Bottom Line: This is a good card for limited, definitely. Eric's Review - Another aura searching card and it goes to your hand. It is also a 1/2 so it's more for its search utility than anything else. Bottom Line: Best for limited, possibly specific EDH decks. 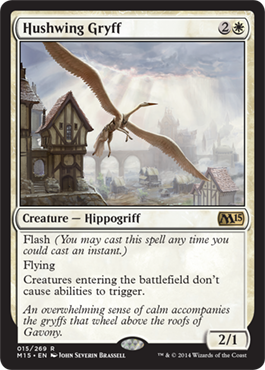 Eric's Review - a 2/1 with flying for three mana that can be cast at any time. 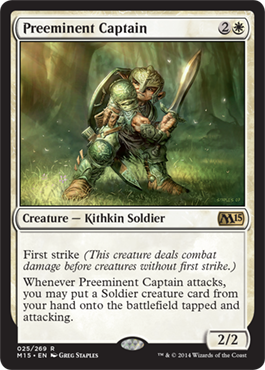 It prevents other creatures from entering the battlefield with their abilities triggering. Bottom Line: Definitely could see play in Standard, limited, and even possibly Modern. Eric's Review - A two mana 2/2 that gives another creature +1/+1 for the turn. Can be pretty useful. Bottom Line: Go for Standard and Limited. Eric's Review - An enchantment that gives +2/+2 and vigilance is definitely powerful. 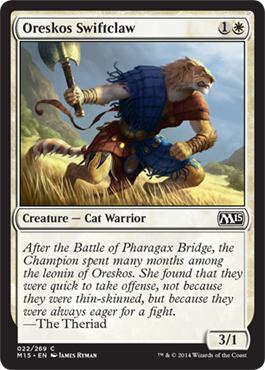 Bottom Line: Definitely a good card for Standard and Limited. Eric's Review - A white board wipe that works for any white weenies deck because it annihilates all creatures that you don't play. 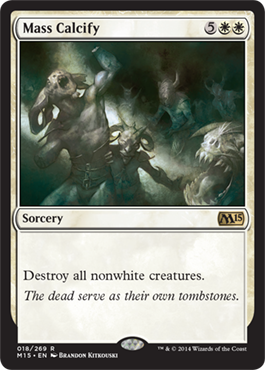 Bottom Line: This will likely be the new Standard board wipe for control decks using white. Eric's Review - A five mana spell that gains eight life. With Convoke, this is a card feasible to be played since five mana is too much. Bottom Line: Convoke makes this playable. Good for standard and limited. Eric's Review - A card from Innistrad, it is a 2/3 for three mana that untaps whenever a creature enters play. Bottom Line: Definitely good for limited and a possible choice for Standard. Eric's Review - A reprint from... Journey into Nyx. 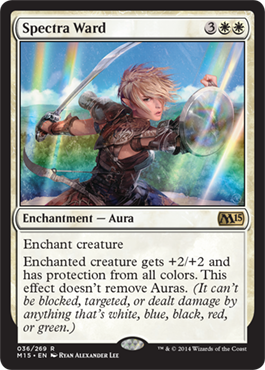 Bottom Line: Already in Standard during the time M15 will be anyway means this was printed for a limited environment, so this is purely for Limited. Eric's Review - Yet another reprint. Bottom Line: A 3/1 for two is good, but this was reprinted this soon for Limited purposes. 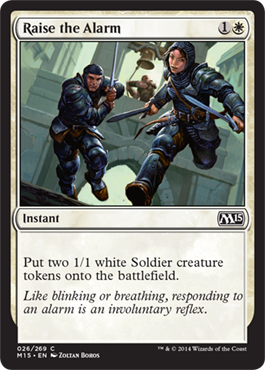 Eric's Review - A great new card that boosts other creatures and also has the ability to give another white creature vigilance. 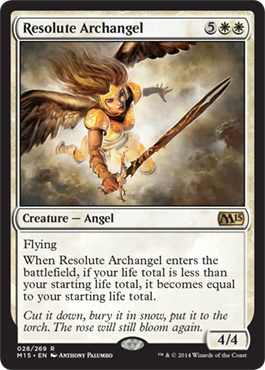 Bottom Line: This is definitely good in Limited, it will be good in Standard, and decent in EDH. Eric's Review - A powerful spell for getting rid of large creatures. Bottom Line: Good in Limited and good in Standard. 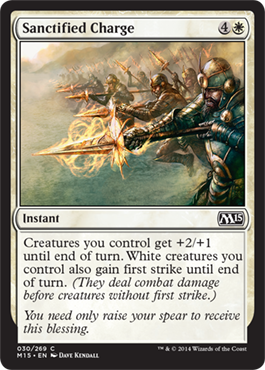 Eric's Review - A 2/2 for three mana with first strike that lets you put soldiers into play attacking when you attack with it. Bottom Line: Could be decent in Limited and definitely great in Standard, possibly Modern. 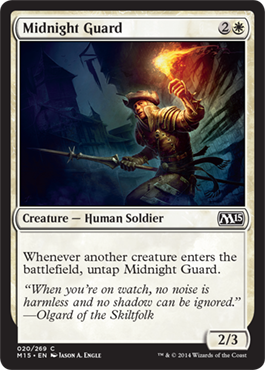 Eric's Review - A powerful spell recently found in the Modern Event Deck plays into what seems to be a Soldier theme. Bottom Line: This is a great spell in any format. 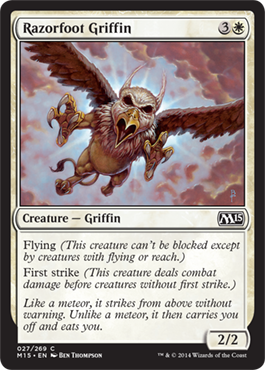 Eric's Review - A reprint that is a 2/2 with flying and first strike. Bottom Line: Definitely a better card for Limited. Not too great in Standard. Eric's Review - A 4/4 for seven mana that resets your life to your beginning total if it is lower. 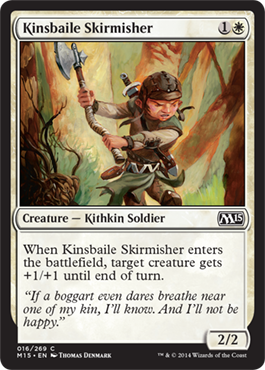 Bottom Line: More of an EDH card, it still definitely has the potential for Standard. Eric's Review - A spell that would work well with Shadowborn Apostle and other small creatures. Convoke definitely helps spells with X in their cost like this one. Bottom Line: A spell for Standard, Modern, EDH, and maybe Limited, but not as much with less creatures to go around. Eric's Review - A five mana pump spell that gives all your creatures +2/+1 and all your white creatures first strike is powerful. Bottom Line: A bit high costing, but still something for a White Weenies deck. Eric's Review - A reprint from Innistrad. 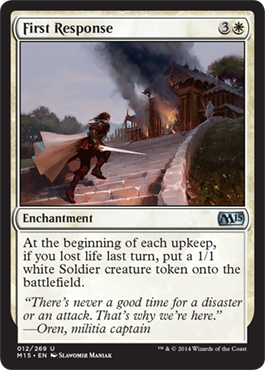 Bottom Line: Can be useful in Standard, especially White Weenies, good in Limited, and potentially useful in Modern. Eric's Review - A seven mana creature with Convoke that is the size of the number of creatures you control. Bottom Line: Powerful in Limited and possibly White Weenies. Also playable in Standard. 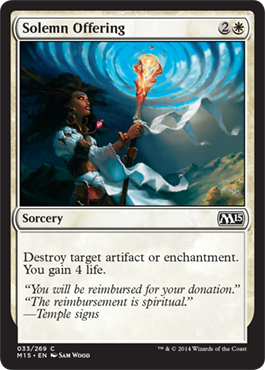 Eric's Review - A reprint to take care of enchantments from Theros and artifacts that have a theme building in M15. Bottom Line: Useful in Standard and Limited. Also good for EDH. 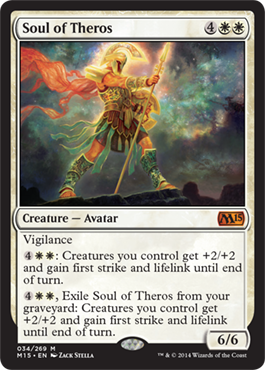 Eric's Review - Soul of Theros, a powerful 6/6 creature with vigilance that for six mana gives all your creatures +2/+2, first strike, and lifelink for the turn. Definitely a powerful card. Bottom Line: Strong in Limited, Standard, and EDH. Possibly has a place in Modern. Eric's Review - A reprint from M14, this is a 1/1 that can tap for one life. Bottom Line: Good in Limited and Standard. Eric's Review - A five mana enchantment that gives +2/+2 and grants protection from all colors. Definitely a strong spell. Bottom Line: Limited and Standard are good places to find this spell. 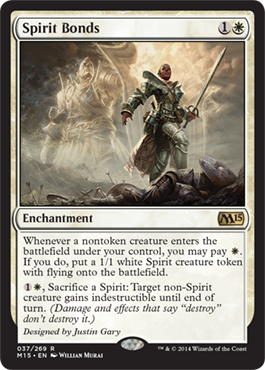 Eric's Review - A two mana enchantment that allows you to pay one mana to create a 1/1 white spirit token whenever a nontoken creature enters play. Also has the ability to sacrifice spirits to make another creature indestructible for the turn. Bottom Line: Powerful for Standard and limited. Possibly strong for Modern too. 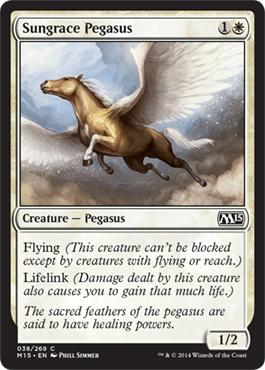 Eric's Review - A two mana 1/2 with flying and lifelink. Bottom Line: Good for Limited and Standard. Eric's Review - A 2/3 for five mana, it is just a creature that gives 3 life. Not a great card as Divine Favor is much better. Bottom Line: Not a great card, but could find a use in Limited. Eric's Review - A six mana spell with Convoke that puts three spirits into play. 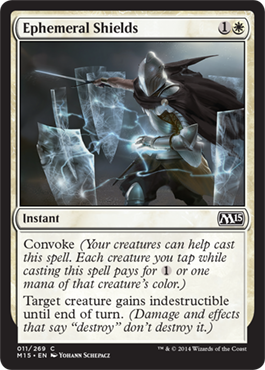 Bottom Line: There are more powerful spells like Spectral Procession, but for Limited and Standard, Convoke makes the difference. 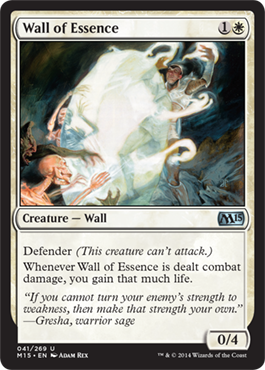 Eric's Review - A 0/4 wall for two mana that gains life for the damage dealt to it. 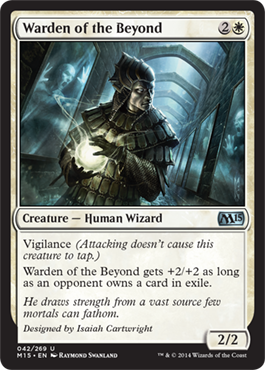 Eric's Review - A 2/2 with vigilance for three mana that checks for exiled cards owned by an opponent in order to boost it to a 4/4 creature. Bottom Line: Good for Limited and Standard as well as EDH.